Kieran Millan was back on the Internet airwaves this week with another interview on the Edmonton-based Pipeline Show hosted by Guy Flaming. Millan had appeared on the program back in February following BU's Beanpot title game win. This week’s segment (audio clip) began with ESPN’s call of Millan’s sparkling save against UNH’s Mike Sislo in the regional final. The host talked with Millan about being an NCAA champion as a freshman and his being drafted this past June by Colorado. Even in the heat of late August, Nick Bonino is finding the back of the net. The Terriers’ top returning scorer and assistant captain spent the past week in Cromwell, Conn., at the fourth annual Peter Asadourian Pro Hockey Camp. 32 pros and collegians participated in the camp, which “featured a week of intense strength training and on-ice workouts,” and concluded on Friday night with a scrimmage open to the public. In the scrimmage, Bonino scored a pair of goals in Team Boguniecki’s 8-2 win over Team Hainsey. The Saponari Brothers, Victor and Vinny, were interviewed by Thrashers.com about the Terriers’ championship season and the upcoming outdoor game at Fenway Park against BC. • 2005 Beanpot seminfinal and championship game. In addition, look for newly added HD-quality highlights of the Vermont and Miami Frozen Four games on the 2008-09 game highlights. Many thanks to Sean Pickett who posted all these new video clips on YouTube. Also new in the annex is some additional scouting information on 2011 recruit Cason Hohmann, courtesy of our friends at Amateur Hockey Report. • Red Hot Hockey, the Nov. 28 Madison Square Garden match-up of BU and Cornell now has its own Web site. Colin Wilson and his buddy James Van Riemsdyk (formerly at UNH) were among those first-year pros invited to the UpperDeck trading cards rookie shoot yesterday in Mississauga, Ontario. Hockey's Future has begun posting its Fall 2009 top 20 prospects for each NHL team. Seven current and former Terriers are among the players reported thus far. Click here for player descriptions. The Terriers’ 2009-10 schedule is out and shows 34 regular season games, including 16 home games and four on neutral ice. Following a pair of exhibitions at Agganis Arena against St. Francis Xavier (Oct. 3) and the U.S. NTDP U-18s (Oct. 10), BU opens on the road against UMass (Oct. 16). Four days later, BU meets Notre Dame--whom the Terriers battled throughout last season for the top spot in the polls-- in the home opener when the Terriers’ fifth NCAA championship banner will be raised. BU Athletics news release. Red Hot Hockey (Facebook page) returns on Nov. 28 when BU and Cornell again face off in New York's Madison Square Garden. (video clip) The January 8 game against BC at Fenway Park, announced last week, will be the Terriers’ first outdoor game since a 1956 matchup with Tufts at MIT. BU also announced that its All-Access service will return, providing online viewing of more than 75 athletic events—including most home hockey games. Pricing details. USCHO takes a look at the Terriers' off-season workout program, with BU associate head coach Mike Bavis comparing the current regimen with what he experienced as a player some 20 years ago. 2011 recruit Cason Hohmann lived up to his playmaker reputation with a 1-4-5 scoring line in four games for the U.S. Select U17s at the Five Nations tournament in Fussen Germany. In the final game of the tournament, Hohmann had a pair of first-period assists in Team USA’s 9-6 win over the host team. Adding some color to previous news reports, here are some tidbits from yesterday’s news conference announcing the January 8th Hockey East doubleheader at Fenway Park between UNH and Northeastern (women) and BC and BU (men). • Current Terrier players attending the press session were Ross Gaudet, Kevin Gilroy, Andrew Glass, Nick Bonino and David Warsofsky. • Mike Sylvia, Peter Donatelli and BU assistant coach Buddy Powers were among former Terrier players looking on. •Sam Kennedy of the Fenway Sports Group (Red Sox) emphasized that the doubleheader brought together elements of diverse groups and sports. To illustrate this fact, he mentioned that Bill Monbouquette, a Red Sox pitcher from the 1950’s-60’s and a twenty-game winner in 1963, was among those attending the press conference. • The rink will sit in the outfield. Center ice will be in short center field. One end will be where the 3rd base seats jut out toward left field. The other end will be in right field. • During his remarks, Kennedy referred to Hockey East commissioner as a “legend”. When the bemused Bertagna stepped to the microphone, he mentioned he was aware that comment must have caught the attention of and amused Jerry York and Jack Parker. • Jack Parker noted the deficiencies in the ancient Fenway Park locker rooms and joked that it may be better for his team to dress for the game in their dorm rooms. ► 2011 recruit Cason Hohman scored the third goal for the U.S. U17 Selects in a 4-3 win over Switzerland in the Five Nations tournament in Fussen, Germany. Hohmamn’s second-period slapper hit the post and went into the net. Video Link . Hohmann is #14 in blue. 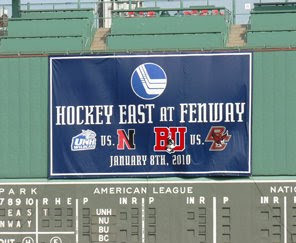 This morning, the Boston Red Sox, Fenway Sports Group and the Hockey East announced the much anticipated January 8 doubleheader at Fenway Park that will begin with a women's game between New Hampshire and Northeastern and will conclude with the 248th renwal of the BU-BC rivalry. We have links to some news coverage, the news release on GoTerriers.com and photos. Check back tomorrow for more details and comments from the press conference that was held on the playing field at "Canvass Alley." Look for the Terriers' 2009-2010 schedule to be announced tomorrow. BU's exhibition game with St. Francis Xavier is just six weeks from this Saturday, Oct. 3. Brian Durocher, coach of the Terrier women’s hockey team, has received a three-year renewal of his contract. The ex-Terrier goalie, co-captain of the 1978 national championship team and former assistant to Jack Parker was the Hockey East Coach of the Year in 2007-08. The annual Shawn Bates Scholarship Awards of $1,000 were presented to Medford High School graduates Steve Servido and Richie Lebert. A Terrier fan favorite known for his speed, Bates, the all-time leading scorer at Medford High, scored 143 in his four-year BU career and was a member of the 1995 national championship team (video clip). He went on to play for the Bruins and the Islanders before spending the 2008-09 season with HIFK Helsinki. He’s a skill player. He needs some work as far as understanding the defensive part of the game in his own end zone. But the thing that I love about him is he’s trying to get up the ice all the time. He’s got a fair whack at it this year. There are a couple of wide-open spots on D, and it’s important that we develop some young defensemen. 2011 recruit Cason Hohmann, described by U.S. Hockey Report as “a super-skilled forward,” assisted on the first goal for the U.S. Under-17 Select Team in a 3-2 loss to Slovakia,at the 2009 Under-17 Five Nations Tournament in Fussen, Germany. The Boston Red Sox, Fenway Sports Group and the Hockey East Association will hold a joint press conference at Fenway Park Thursday morning at 11 a.m., to announce the worst kept secret of the summer. The iconic ballpark on Landsdowne Street will host a college hockey doubleheader on January 8 with the Terriers meeting archrival Boston College in a matchup of the past two NCAA champs. THFB will be there and provide details. For Chris Drury, the list of honors just keeps growing. 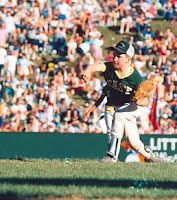 Twenty years after pitching Trumbull, Conn., to the Little League World Series championship, the former two-time first team All-American and Terrier captain will be inducted into the Little League Hall of Fame during the upcoming World Series in Williamsport. A member of the BU Athletics Hall of Fame since 2003, Drury became the 13th Terrier in the Beanpot Hall of Fame following his induction this past February. He was a member of the first class (1998) to win four Beanpot titles, and, in BU’s 2-1 OT win against Harvard in the 1998 title game, scored BU’s first goal and assisted on the game-winner. Currently the captain of the N.Y. Rangers, Drury is the only player to win both the Hobey Baker Award (1998) and the NHL's Calder Trophy as top rookie (1999). This week, Drury and former Terrier defenseman Ryan Whitney are attending U.S. Olympic orientation camp in Woodridge, Ill. Roster. ►2003-04 Terrier captain Mark Mullen (mentioned just a few days ago in our report on 2011 recruit Cason Hohman) has left his position as assistant coach for the USHL Cedar Rapids Roughriders to become a scout for the Los Angeles Kings. On the Kings staff, he’ll join: former Terrier Steve Greeley, a pro scout; amateur scout Bob Crocker, a longtime BU assistant coach under Jack Kelley; and former BU All-American goalie, Jack Ferreira, who is special assistant to the general manager. Terrier recruits choose to play hockey at BU for a wide variety of reasons: Coach Jack Parker and his staff, the long and rich tradition of Terrier hockey, Hockey East, The Beanpot Tournament, Agganis Arena and its state-of-the-art training facility, strong academics. And, very often, they cite strength and conditioning guru Mike Boyle, a highly respected innovator who has worked with BU athletes for more than two decades. Case in point: Incoming freshman Alex Chiasson, explaining to NHL.com the factors that led to his decision to play for BU, pointed out that “Mike Boyle is there and he's known around the world for what he's done with hockey players." "(Mike) is an innovator, a pioneer. He always believed that if you train fast, you play fast," Sacco said. "If you train slow, you play slow. His philosophy is all about speed and strength. When you did plyometrics or sprint work, it would make you faster on the ice. If you were going to run a marathon, then you train for distance, but when you're talking hockey, it's all about speed and strength. I always felt like I went to training camp in the best possible shape." John McCarthy, co-captain of the 2008-09 Terriers and a recent San Jose signee, talked about the Boyle approach during an interview following Sharks’ development camp. Boyle also has been a consultant for USA Hockey's National Team Development Program in Ann Arbor. ►At USA Hockey’s National Junior Evaluation Camp, sophomore right wing Vinny Saponari had a goal in the USA’s 6-4 loss to Russia on Friday. Saponari and fellow sophomore David Warsofsky each picked up an assist in the final game against Russia on Saturday, a 6-0 shutout. Warsofsky, who is in Lake Placid for his second NJEC, discussed his strengths and efforts to enahnce his game in a video interview. In six games (2 intersquad, 4 vs Russia) Saponari has a 1 goal and 4 assists; Warsofsky had 1+2 in 7 games. ►Last weekend, former Terrier captain and Hobey Baker winner Chris Drury reunited with his Trumbull, Conn., Little League teammates to mark the 20th anniversary of their victory in the championship game of the 1989 Little League World Series. Drury pitched the final game, beginning two decades of athletic achievement, which was recounted by in 2007 by Sports Illustrated. Following quickly on the heels of Robert Polesello’s commitment for 2012, the Terrier coaching staff has received a verbal commitment for 2011 from right-shot center Cason Hohmann, a top ’93 birthdate prospect. 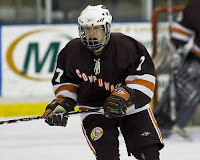 Hohman, a 5-8, 165, native of Dallas, now living in Plymouth, Michigan, put up 24-32-56 in 31 games to lead Compuware to the Midwest Elite Hockey League U16 Midget Minor championship. He led the league in both points and assists and had more than twice as many points as any of his teammates. Then, in April, Hohmann led Compuware to the Tier I U-16 title in USA Hockey’s Midget Nationals, tying for the team lead—as well as the overall tournament lead--in scoring with a 1-13-14 line in 6 games. Earlier this summer, Hohmann was the leading scorer (1-8-9) at the USA Hockey Select 16 Festival, earning a spot on the Select US team that will compete at the 2009 Under-17 Five Nations Tournament from Aug. 18-22, in Fussen, Germany. Next season, Hohmann will play in the USHL for Cedar Rapids, whose assistant coach is former Terrier captain Mark Mullen. The highly skilled forward was the RoughRiders’ first pick, the second player taken overall in 2009 USHL Futures Draft. "[Hohmann] is a very skilled player. Many people question if he will continue to produce every year because of his lack of size. But every year, he surprises everyone. He is consistently at the top of the scoring board and has a knack for creating offense. He is a very determined player and is hungry for the puck at all times." 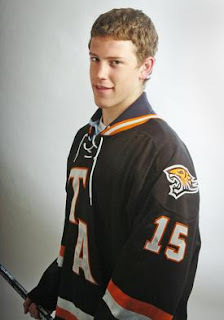 ► 2010 recruit Charlie Coyle, playing for the U.S. Select U18s in the Ivan Hlinka Tournament, scored the game-winner on a penalty shot in Tuesday’s 3-2 win against Finland. Today, Coyle scored a second-period goal in Team USA’s 7-6 overtime win against host-team Slovakia. The U.S. meets Sweden on Saturday in the third-place game. Full news release with Coach's comments on each recruit. The 2009-10 team roster also has been posted on GoTerriers.com and shows a few changes in uniform numbers for returnees. Sophomore Corey Trivino switches to #10, the number he wore in Junior A and also the number of his soccer hero, Diego Maradonna. Trivino's linemate from last season, Vinny Saponari, currently at U.S. Junior National Team camp, was featured—and pictured—in a USAHockey.com article about players from non-traditional hockey states. Saponari is a Georgia native. A few of our readers recently pointed out a posting of the 2009-10 Des Moines Bucs roster that didn't include 2010 recruit Yasin Cisse, who played for the Bucs last season. And one rumor had him talking to the Moncton Wildcats, the QMJHL club that holds his draft rights. Yesterday, The Transcript & Times of Moncton reported that Cisse has turned down the Wildcats and plans to return to the USHL--but the writer declined to name the college to which Cisse has committed. 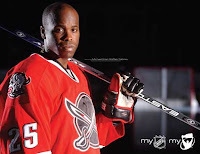 Ex-Terrier All American Mike Grier returns to the Buffalo Sabres, after signing a one-year free agent contract. The 34-year-old winger spent the past two seasons with the San Jose Sharks where he was an alternate captain. ► David Warsofsky and Vinny Saponari, who have been in Lake Placid this past week at the U.S. Junior National Team evaluation camp, both made it through the first group of cuts as the squad was reduced from 42 to 29 players. Warsofsky is one of 10 remaining blueliners and Saponari is one of 15 forwards. Tomorrow night, Team USA plays the first of four games against Russia. Camp concludes on August 15. Ex-Terrier John Hynes, who recently was joined the Penguins’s AHL affiliate coaching staff, is assisting Jr. National Team coach Dean Blais during the evaluation camp. USA Hockey Media Guide. ► The BU Showcase for high school and prep players began its second season at Walter Brown Arena on August 10. Former Associate Head Coach David Quinn and Mike Bavis, who now holds that position, are the directors, assisted by BU strength and conditioning coach Mike Boyle and numerous other college coaches. Polesello, who played up with the Toronto Jr. Canadians ’93 team last winter, also was the East Coast Selects’ 2008 Player of the Year. An A student at the PEAC School for Elite Athletes, he helped lead the Selects ’94 club to a championship in the Prospects Hockey Tournament in 2009. Other competitors for Polesello included BC, New Hampshire and Michigan. In The Boston Globe’s Sunday Hockey Notes, Fluto Shinzawa examines David Quinn’s recent move from Associate Head Coach at BU to Head Coach of the AHL Lake Erie Monsters. BU 2010 recruit Charlie Coyle's hockey career has been following a similar path to the one previously taken by his cousin, former Terrier and NHL standout Tony Amonte. Coyle has been a high-scoring forward at Thayer, prepping for his college years in Scarlet & White. Now, just as his famous relative did, he’s earned the opportunity to wear Team USA colors. Off a strong performance at the USA Hockey Select 17 festival where he was third in scoring overall, Coyle was named to the U.S. U-18 squad that will play in the Ivan Hlinka Memorial Tournament in Slovakia beginning Aug. 11. As reported recently Coyle, who led Thayer in scoring with 20-28-48, is accelerating his education to graduate next June and will skate next season for the South Shore Kings of the EJHL. Coyle spoke with the Quincy Patriot Ledger about making the Select team and the upcoming international event. The BU athletic department made official the coaching news we posted several weeks ago: Mike Bavis (photo) has moved up to fill the associate head coaching slot, replacing David Quinn, and former Terrier and head coach at two Division 1 schools Buddy Powers has joined Jack Parker's coaching staff. Bavis is entering his 12th season as a Terrier coach. Former Terrier forward and US NTDP head coach John Hynes has left his post with USA Hockey to become assistant coach for the Pittsburgh Penguins’ AHL affiliate in Wilkes Barre/Scranton. 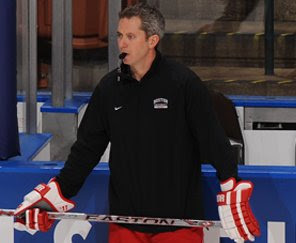 Hynes, a member of BU’s 1995 National Championship team, spent six seasons in Ann Arbor coaching NTDP U-17 and U-18 teams, including the 2006 U-18 team that won a gold medal in the World Championships. That squad was captained by Brian Strait who recently signed a multi-year deal with the Penguins and may begin his pro career with the Baby Pens. Hynes began his coaching career as a BU grad assistant and later was an assistant at UMass-Lowell and Wisconsin. Wilkes Barre Times Leader coverage. Former BU All-American goalie John Curry, who spent the past two seasons with Wilkes Barre/Scranton has re-upped with Pittsburgh for two seasons ($500K/year) . He’ll contend for the backup netminding job with the Stanley Cup champ Penguins. The calendar says August, but with BU's exhibition game against St. Francis Xavier just two months away, Terrier fans can start looking ahead to next season and defending the NCAA championship. Last season, BU's record was 25-0-3 in games in which Bonino had at least one point. His season totals were 18-32-50. Polesello, who is likely a 2012 recruit, was observed by both BU Head Coach Jack Parker and his top assistant, Mike Bavis--and their BC counterparts--at the recent Jr. Chowder Cup tournament where he excelled. He plays in the Toronto Jr. Canadians system and was called up to the Junior A level club for a few games last season. Polesello also has played for Travis Howe’s East Coast Selects tournament club, where he earned all-star honors at the 2008 North American Prospects Showcase. Howe reports that Polesello is a “gifted skater and player” who was the ECS ’94 Player of the Year last year. Four current Terriers, Kevin Shattenkirk, Colby Cohen, Corey Trivino and Alex Chiasson, are ECS alums. Earlier last week, USHR reported that BU is among the front-runners for two top 2010 recruits from British Columbia: Left wing Sahir Gill and left defenseman Isaac MacLeod. Gill was a high-scoring forward for Canada's RBC Cup winner Vernon this past season, and a teammate of incoming BU freshman Ryan Santana. This season he moves to the USHL joining the Chicago Steel. MacLeod, 6-4, 195, is a highly-regarded blueliner who will skate for the BCHL Penticton Vees this season after leading the Nelson Leafs to the Kootenay Internation Junior B Hockey League title.